A dental crown is a great way to restore a damaged tooth. In fact, crowns can sometimes provide sufficient structural protection to prevent you from losing a tooth that is severely damaged or decayed. Dr. Greg Larsen specializes in finding the best type of crown for your particular needs. If you’re ready to restore your smile and regain proper tooth function, reach out to Dr. Larsen to schedule an appointment at the Sandy, Utah, office. Dental crowns are artificial dental devices that Dr. Larsen fixes into position. They strengthen damaged teeth and also address a wide range of cosmetic concerns. Crowns also form the visible portion of dental implants. What is the process of getting a crown like? Dr. Larsen begins with a thorough dental exam to determine if a crown is the best treatment option. If so, he carefully removes a small portion of your tooth tissue to make room for the crown to be correctly positioned. Next, Dr. Larsen’s staff make impressions of the prepared tooth. These give the dental lab the information they need to craft your custom crown. Once it arrives, you’ll return to have Dr. Larsen check the fit before cementing the crown into place. You may need to return for a follow-up visit to ensure that your gum tissue is adjusting to the new crown. From that point forward, your restoration is complete, and your crown will look and function just like the rest of your natural teeth. You have several choices when it comes to the material for your dental crowns. There are pros and cons of each choice, and there is no one-size-fits-all solution. Dr. Larsen can help you determine the best possible material for your new custom crown. Porcelain crowns offer a beautiful cosmetic finish and can match the shade of your natural teeth. They are also a good fit for those with metal allergies. This material choice is more expensive than some metals. Resin crowns are an affordable option, but with that affordability comes a reduction in durability. Resin crowns are more likely to fracture than other types, and they also wear down more quickly. Numerous metals are used to make crowns, including base-metal alloys like nickel-chromium and alloys containing silver or gold. 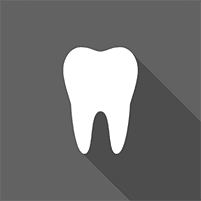 Metal crowns are the most durable option, able to withstand significant biting force. Some people are drawn to the bold look of silver or gold crowns, while others find the metallic appearance to be a drawback. This approach uses a thin layer of porcelain over a metal base. These crowns offer a natural appearance, but they place more wear and tear on surrounding teeth than other options. To learn more about dental crowns, call Dr. Larsen’s office to schedule an appointment.